Current national guidelines call for the use of commercial formula to be used over blended food wherever possible. There are risks which should be kept in mind when considering the use of a blended diet, particularly with regard to infection control. The desire to nurture and feed is taken away from parents whose children are fed via gastrostomy. There is some evidence of benefits as a blended diet could improve some symptoms of diarrhoea and/or vomiting and could give families control of the development of their child. Recent research has suggested that there are concerns over the suitability of blended diet when using new tube equipment and that such diets are nutritionally variable and imprecise. Further high quality, empirical studies are required to understand the benefits, impact and outcomes of blended diets and the experiences of the children and families who use them. Although the use of blended diets via gastrostomy are receiving growing support in international literature as an alternative to nutritional formula feeds, their effects have not been well studied or evaluated in the UK. There is an urgent need to address this issue to overcome the risk of families trialling the diet for themselves in the absence of any professional guidance or literature. Importantly, families who have been informed about the potential benefits of a blended diet approach have helped to generate and drive interest, making the push to recognise blended diets user-led. It is often the issue of choice that families hold on to, as they chose how to feed their own child. It is hoped that this literature review will highlight key considerations of a blended diet to carers, dieticians and family members. The overall aim of this paper will be to review the literature in order to explore research opinion on whether blended diet is a valid alternative to commercial formula for children who are enterally fed via a gastrostomy. There were no limitations put on how this was qualified and included articles that explored and reported medical, nutritional and social outcomes and experiences. A rapid review method was employed using systematic principles. These will be detailed throughout the following section. The online supplementary table summarises the studies which were included in the review. Figure 1 highlights the methodological approach and the inclusion and exclusion criteria in greater detail. Flow diagram showing the results of the searches. See online supplementary appendix A for protocol. Key databases were searched including PubMed, MEDLINE, CINAHL, PsychINFO and Google Scholar. Searches took place between August and December 2014 and detailed searches were saved. The searches and extractions were verified by additional reviewers. Results included peer-reviewed journals only where research outcomes are presented. Studies need to be published in English due to the time constraints of the review. Studies had to explore a blended diet as a real alternative to commercial formula feeds. Studies that examined blended diets and gastrostomy care for adults were included if findings were easily transferable to children and young peopleiii with gastrostomies. For inclusion, studies need to focus on gastrostomy and must consider blended diets as a type of feed. This is important because although there are few studies specifically exploring blended diets, there are studies which consider a blended diet while examining commercial formulas. Studies which did not focus on original research (eg, literature reviews) were excluded as were articles which were solely theoretical in nature (eg, did not report outcomes). A data extraction sheet was used to record the critical appraisal of the selected studies. Data extracted included topic, study design, methodology, outcomes and author's conclusions, limitations and reasons for exclusion, if applicable. Throughout the process checking and verification took place by at least an additional two members of the team. Information from the dataset was synthesised into a coherent narrative to address the aims and objectives of the review. Themes were extracted from the data pertaining to experiences and perspectives around the use of blended diets by children and young people with a gastrostomy. These themes were synthesised into a narrative presentation. Although studies often use phrases such as tube feeding and enteral feeding, and this is reflected in reporting, we focus on feeding via gastrostomy as this is more practically viable. Eighteen articles were included in the review and are summarised in the online supplementary table. Through synthesis of the themes, this review explores the current literature on blended diet with regard to the range of conditions that blended diet is used for, the nutritional value of a blended diet, the impact of a blended diet on family and issues of choice, difficulties and risks associated with home-made blended diets and the benefits of home-made blended diets against the shortcomings of formula feeds. Pentuik et al3 explored the possible benefits of a blended diet for children after fundoplication surgery. It was hypothesised that a blended diet may reduce gagging and retching which have been associated with using commercial formula. Another study which focused on a specific condition was a Croatian study conducted by Kolacek et al.4 The authors tested whether a modular diet would improve chronic diarrhoea in infants aged <1 year. Other studies have explored a wider population of those who require enteral feeding. The study of Daveluy et al5 included those with digestive disorders, neurological and muscular disorders and malignancy. A Polish study conducted by Klek et al6 included a significant population of young people (39 were aged ≤17 years) and included a sample of those with neuromuscular swallowing disorders, cancer-related dysphagia and cystic fibrosis. Pentuik et al3 provided a sample menu which could be modified; this included strained meats, plums/bananas, strained pears/applesauce, strained squash/sweet potations, infant cereals, oil, yoghurt, corn-starch/sugar and formula/milk. This resulted in 25 oz providing 942 calories. The nutrient composition of feeds prepared from normal foodstuffs depends on the nutrient compositions of the foods used.8 As a result, such feeds are variable in their content. Furthermore, these compositions can vary according to the geographical source of the food, the season and stage of maturity when the food was harvested, food-processing methods, storage conditions and cooking methods. Schuitema9 argued that it is difficult to meet a patient's nutritional needs using a home-made liquid diet since it will have a much lower calorie density than prescribed feeds and require much larger volume. Older studies10 also highlighted the inaccuracy of the calorie count for blended food. Novak et al2 also add that, when families attempt to produce blended diets on their own, the result is quite often inadequate fluid, protein and nutrient intake for the child. It is recommended that with children who have high energy needs such as those with hypertonia, a high calorie formula could be added to their blended feed recipe. Schuitema9 suggests that patients' intake of blenderised diets should be carefully monitored along with any outputs (eg, urine; faeces), weight changes and symptoms. Recent research has suggested however that variation in diet is the key to a healthy gut. Claesson et al11 have suggested that the reliance on a single formula may lead to an impoverishment of microbial diversity in the enteric flora, although a formula feed is theoretically nutritionally adequate. It is concluded that use of a single formula could contribute to long-term ill-health in the elderly. The inside diameter of fine bore tubes is small (2–3 mm) and they can easily block because of coagulation of proteins and minerals.18 Feeds, therefore, need to be non-viscous and free of particles that could block the tube. However, the mean viscosity of blended feeds prepared for the 21 samples in the study by Sullivan et al8 was reported to be more than 43 times higher than typical commercial formulas. Consequently, it was felt that some of these samples would not flow easily through nasogastric or nasoenteric feeding tubes and could occlude these tubes. To prevent tube occlusion from a high-viscosity formula, rapid feeding by bolus method or the use of large bore feeding tubes was recommended. Sullivan et al8 concluded that these methods of feeding were poorly tolerated compared with continuous feeding through a small bore feeding tube. Recent research conducted by Mundi et al19 has found that home-made blenderised recipes require more force to push through when using the new ENFit adapter which could have implications for using a blended diet in malnourished patients. Schuitema9 presents a comprehensive list of rules and recommendations to minimise risks when using a blenderised liquid food diet. The list includes the avoidance of mixing additional fibres with liquid diets so that the mixture does not thicken and clog tubes. It is also recommended that in order to prevent bacterial contamination the real food for liquid diets should be pasteurised. Tubes should be rinsed every 4 hours and home-made feeds should always be enterally administered. Additionally, Novak et al2 presents essential criteria to help to determine when a blended real food diet can be safely and competently used. This consists of the following points: when child is medically stable and has treated reflux; when appropriate weight or caloric intake is obtained; when motivated care providers with appropriate kitchen facilities are available; when a gastrostomy tube is at least 14 Fr and when the gastrostomy site is well healed with no infection. Although outside of our inclusion criteria, a recent study has indicated that healthcare professionals report positive experiences when using a blended diet,20 and there is some evidence highlighting clinical improvements from a blended diet in an American study.3 Here a total of 33 children with mean age of 34 months were given a pureed by gastrostomy tube diet in an attempt to improve symptoms, nutrition and hydration. Findings showed that 73% had at least a 50% reduction in symptoms after 2–6 months, no child had worse symptoms and over 50% had increased enteral intake. Similarly, Novak et al2 reported a greater volume tolerance and improvements in reflux and constipation when switching from commercial formula to blenderised tube feeding. The limited evidence suggests that a blended diet via gastrostomy might be effective for improving the food intake of those with chronic diarrhoea and those after fundoplication surgery. There is emerging evidence that a blended diet is being used by families who feel it is more effective than formula feeding, yet the evidence base is not established. There is a suggestion however that a blended diet has a wider social benefit, improving the relationship between child and parent and allowing families to become involved with tube feeding. This review will help to provide vital guidance for families and professionals in knowing the benefits and risks of using real food blended diets via gastrostomy as an alternative to formula feeds. Findings can also be used to inform policy, practice and further research into safely trialling and evaluating the blended diet with gastrostomy-fed children and young people and their families. There is also potential for longer-term benefits from this review that extend beyond those that are reported, which include empowering families to be together for family mealtimes and improve food-sharing which families value so much. More robust research is now needed to explore the risks, benefits, impact and outcomes of blended diets and the experiences of the children and families who use them. The use of blended diet via gastrostomy is becoming increasingly popular. A stronger evidence base would inform professionals as they advise families and would inform development of standardised guidance to support safe, evidence-based practice. British Dietetics Association. BDA Policy Statement. 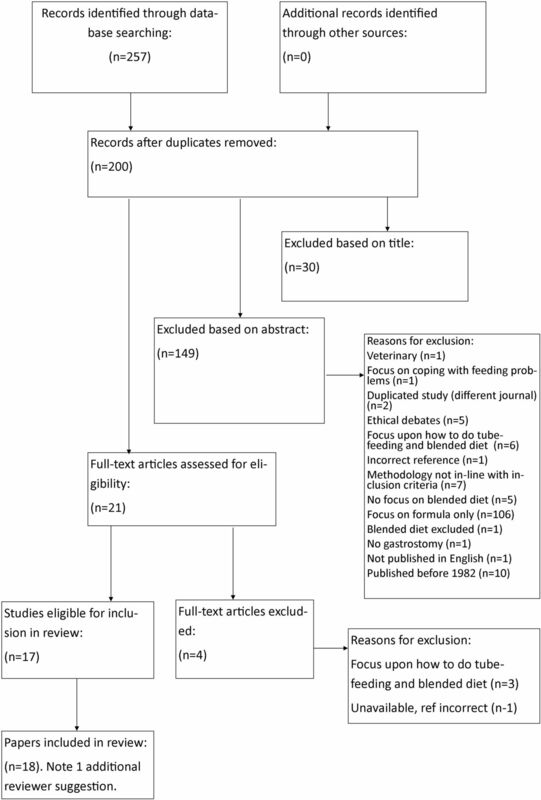 Use of Liquidised Food with Enteral Feeding Tubes. 2013. https://www.bda.uk.com/improvinghealth/healthprofessionals/policystatement_liquidisedfood (accessed Jul 2016).
. Nutritional analysis of blenderized enteral diets in the Philippines. Asia Pac J Clin Nutr 2004;13:385–91.
. Basics in clinical nutrition: diets for enteral nutrition home-made diets. J Clin Nutr Metab 2009;4:e168–9.
. Comparison of institutionally and commercially prepared formulas. Nutr Support Serv 1983;3:32–4.
. Complete tube feeding: everything you need to know about tubefeeding, tube nutrition and blended diets. London: CreateSpace, 2012.
. Feeding and dietetic assessment and management. In: Sullivan P, ed. Feeding and nutrition in children with neurodevelopmental disability. London: Mac Keith Press, 2009:57–85. NICE. Healthcare-associated infections: prevention and control in primary and community care. 2012. https://www.nice.org.uk/Guidance/cg139 (accessed Jul 2016).
. Increased force required with proposed standardized enteral feed connector in blenderized tube feeding. Nutr Clin Pract Published Online First: 18 April 2016. doi: 10.1177/0884533616639126. Contributors JC: principal investigator; JC and AT: substantial contribution to conception, design, acquisition, analysis and interpretation of the data; drafting and revision of the work; final approval was given. JC, SL, JM, MH, CS, HJ, JH, AK, SM and DW: substantial contribution to conception and design of the data and are accountable for all aspects of the work. Funding South Warwickshire Foundation Trust. ↵i We will use the term ‘blended diet’ throughout to refer to the use of blended food administered through an enteral tube. This food contains, at least in part, normal solid food or dairy products usually prepared in the home, which is blended to produce a fine puree or liquid and used through the enteral tube. Alternative phrases such as blenderised, liquidised and homebrew have been used. ↵iii Children and young people are aged 0–25 years for the purpose of this review.